Meadowview is 22 acres in size. It was donated to the Trust in 1988 as part of the development of new homes along Meadowview Drive. The public is welcome to visit this property which is located on Meadowview Drive approximately ¼ mile from Woodchuck Lane. Driving directions: From Woodchuck Lane enter Meadowview Dr. After going down the long hill on Meadowview Drive, the Trust’s gravel parking area is just past the long line of guard rails on the right (see Meadowview parking location). 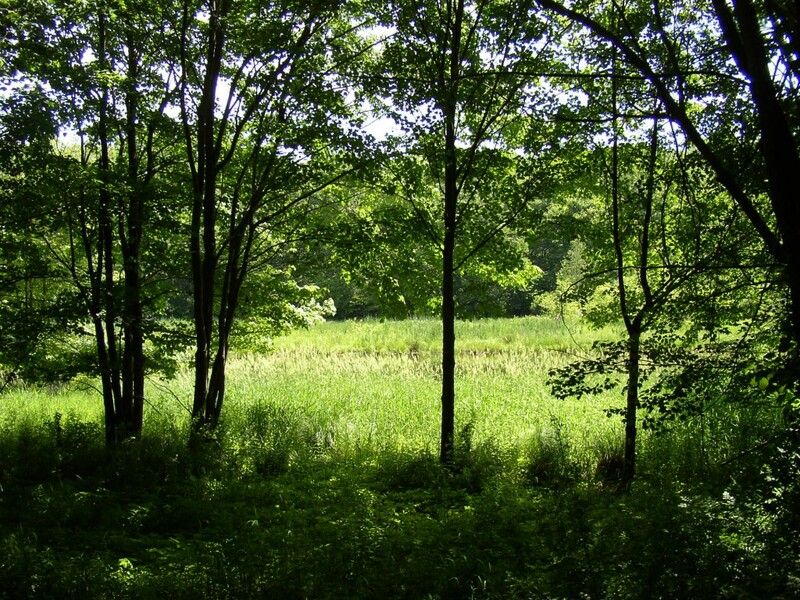 Walk along the mowed area next to the small pond towards the Land Trust sign. 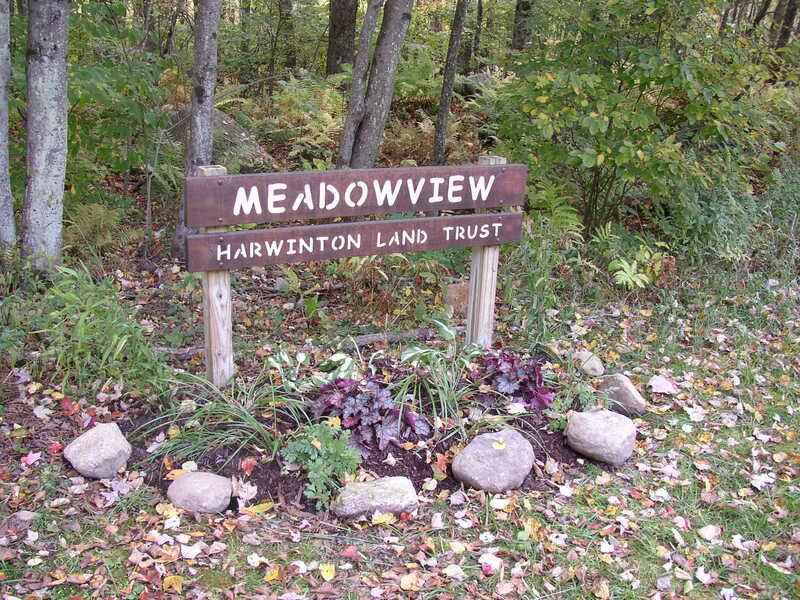 Meadowview’s trail (click here for printable map) begins just beyond the Land Trust sign and enters an open hardwood forest. 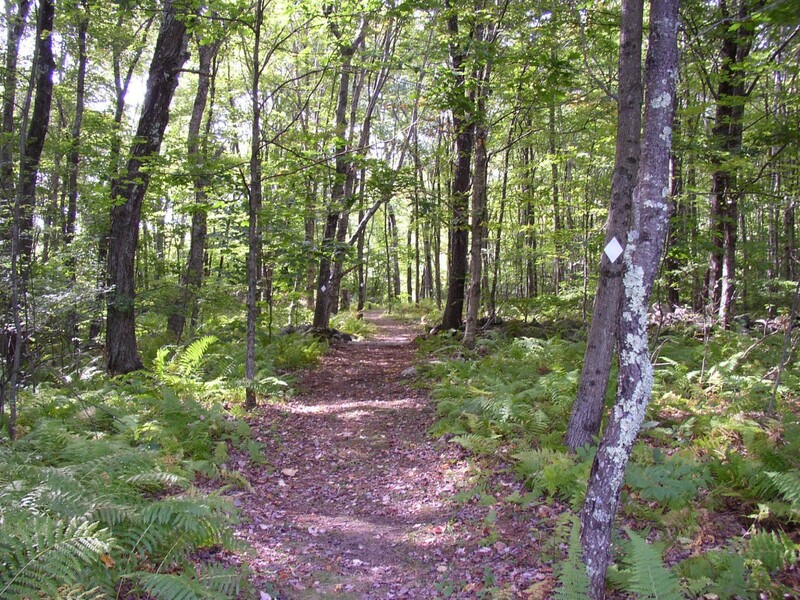 The trail is approximately 3/4-mile long back and forth, and takes about an hour to walk and see the see the sights. There are four geocaches hidden along the trails (see our Geocaching page for more information). 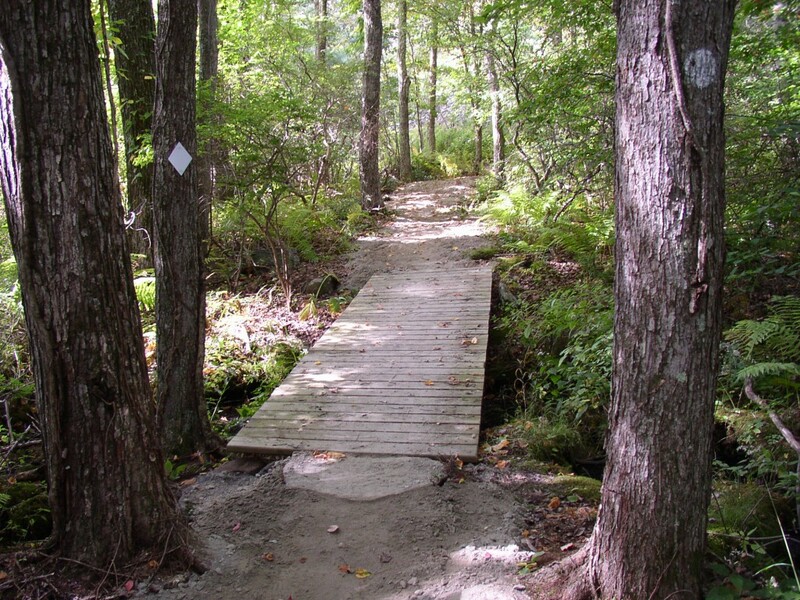 The trail is well marked and maintained, with bridges and boardwalks that provide dry hiking during normal weather conditions. Much of the entry trail has been smoothed with gravel, which should make for very easy walking. A footbridge crosses over a small headwater stream to Leadmine Brook. This water will eventually reach the Housatonic River. Just a short distance away at the other end of Meadowview Drive, water flows into the Farmington River. 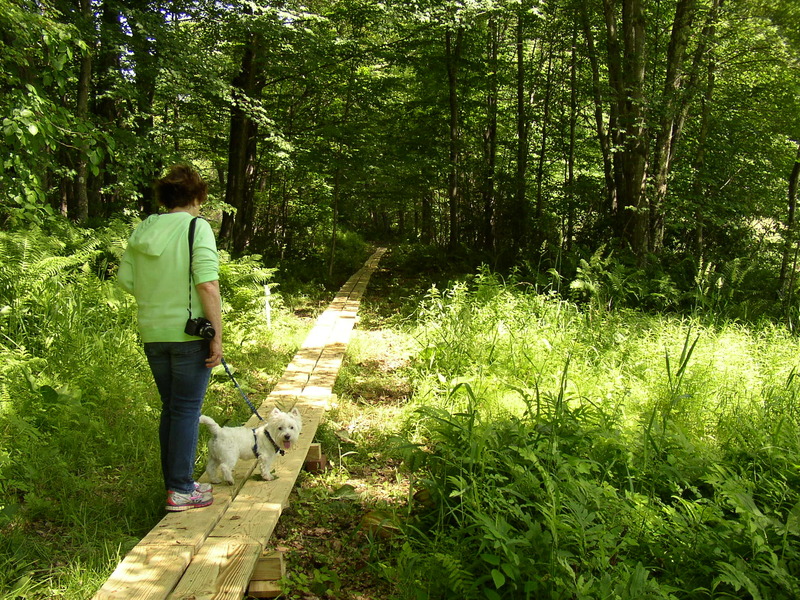 A 200 ft. long boardwalk takes visitors over a soggy section of trail next to marshland. Dogs on lease are welcome to visit and will also be happy to keep their paws dry. 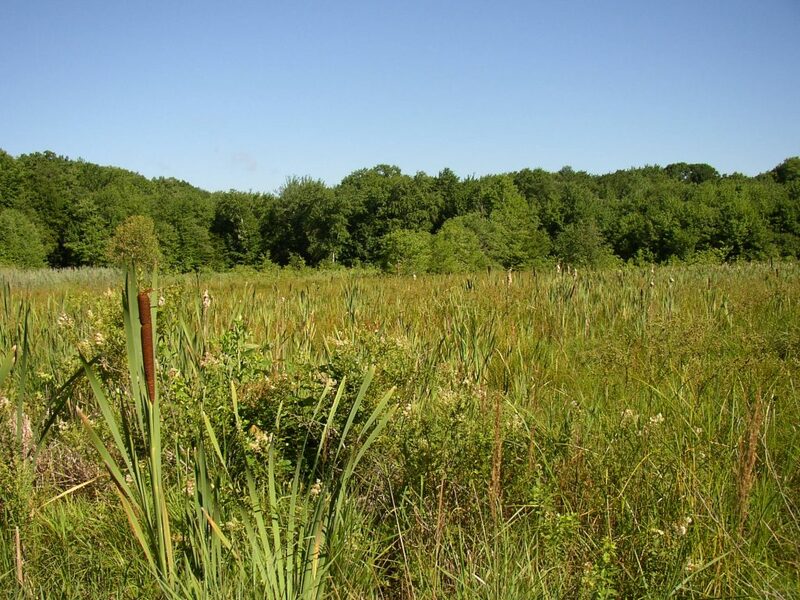 The trail follows alongside a pretty marsh that is filled with bird song. It should be a great place to look for a variety of birds. In some sections, the trail follows old farm roads that are reminders of the area’s agricultural past. After about a 10 minute walk, the trail leads to Meadowview Pond. 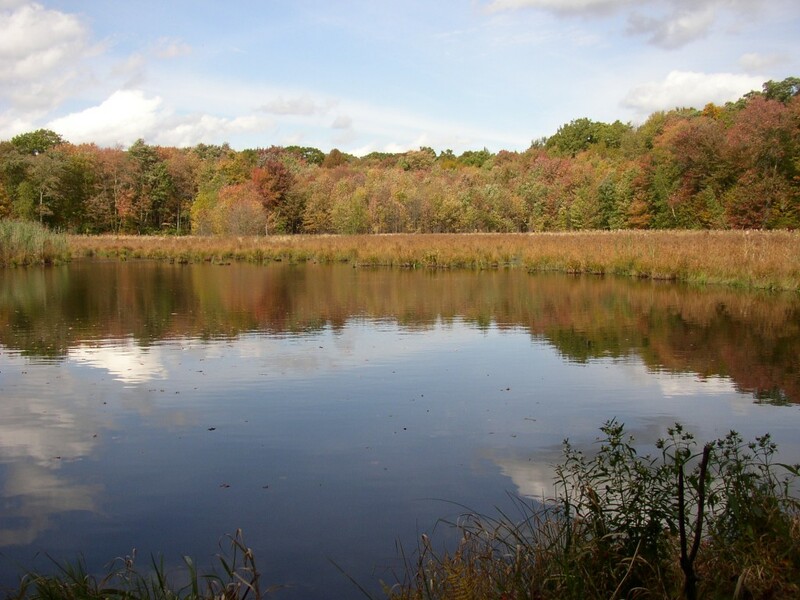 This scenic area should provide good opportunities for wildlife watching. Look for turtles popping their heads above water and listen to the chorus of frogs. Rings on the water’s surface are the result of constant feeding by small fish on insects. At the pond, there is a long boardwalk that leads through marshland. It provides dry walking no matter the season. 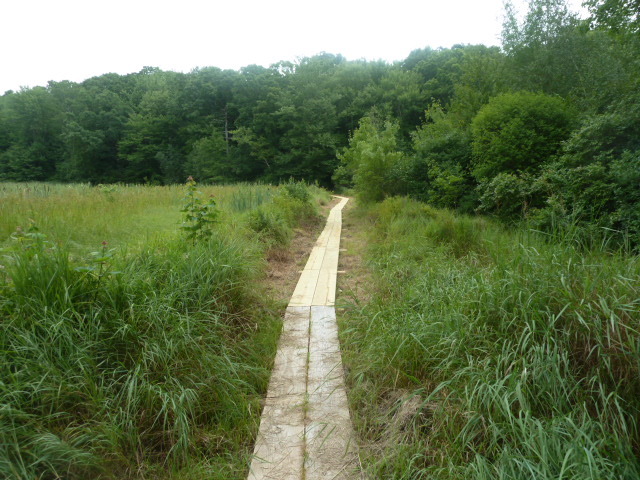 The boardwalk provides scenic views of marshes to the north and south. 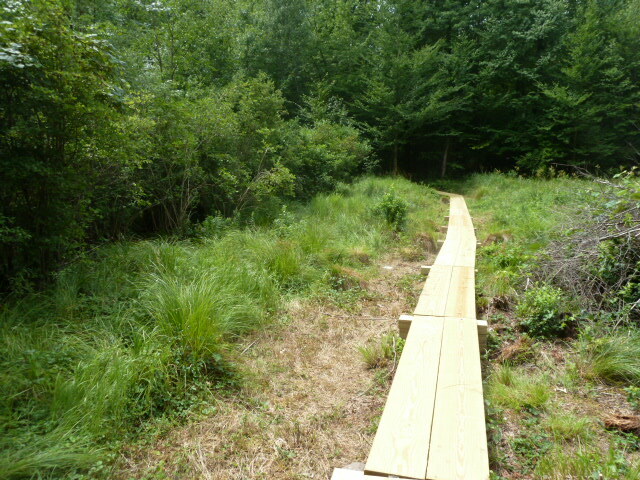 The trail loops into upland forest before entering another boardwalk that crosses the southern tip of Meadowview’s marsh system. Distance views across the vast area of marshland can be seen from this boardwalk. 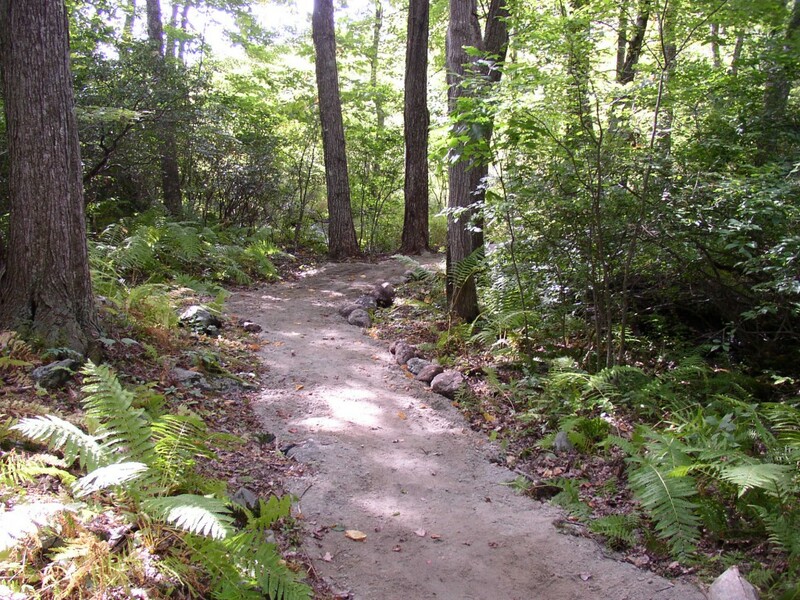 From the main white-blazed trail, visitors can choose to walk the short yellow trail loop. 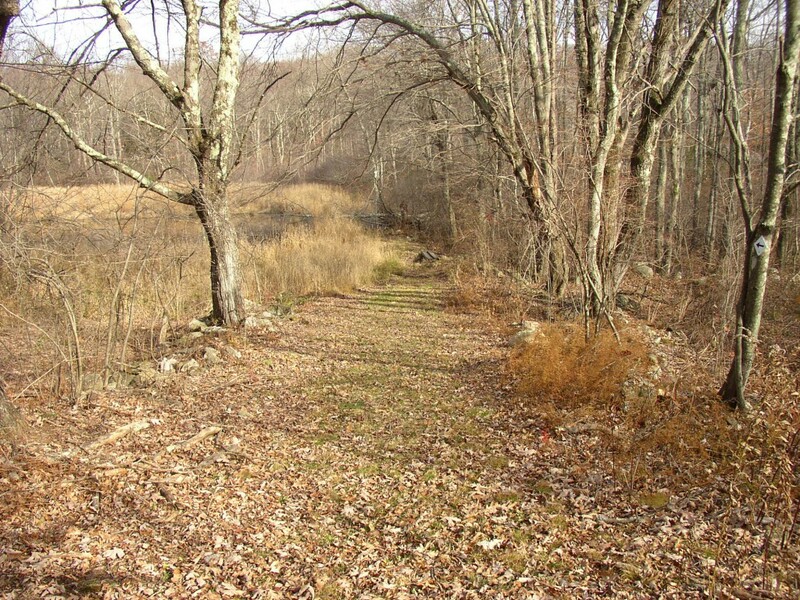 This trail leads to an historic site where charcoal was once produced over 100 years ago. 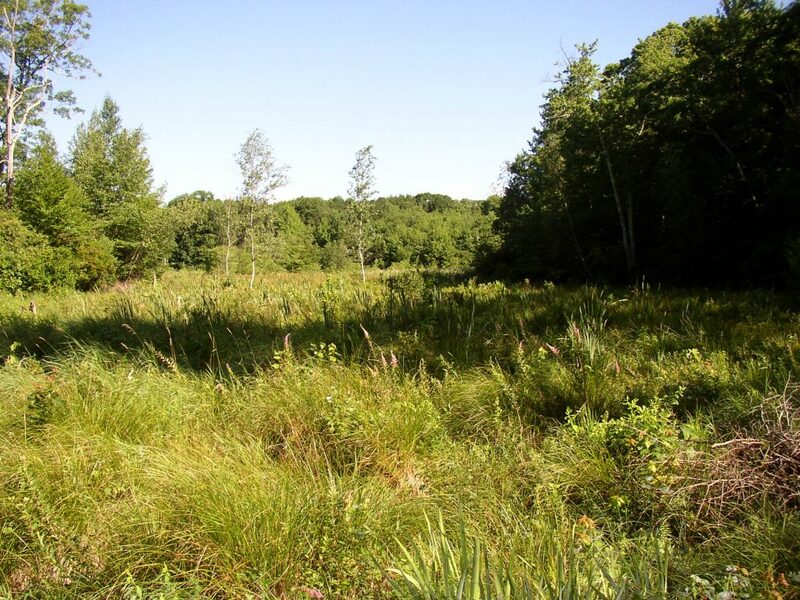 The site can be distinguished by a flat circular mound that is approximately 30 ft. in diameter. To make charcoal back in those times, 30 to 40 cords of wood cut from the surrounding forest would have been stacked 8 to 12 feet high on this flat hearth area. The 4-5 foot-long logs were then covered first with leaves, then with dirt or ash. Red hot embers would have been dropped into the top of the stack, but they did not cause the logs to burn due to a lack of oxygen from the dirt covering. Instead, the wood smoldered for up to a month’s time before drying and condensing into charcoal. The charcoal was then removed from the site and used mainly for the production of iron. No doubt Harwinton would also have had a blacksmith in need of locally produced charcoal. 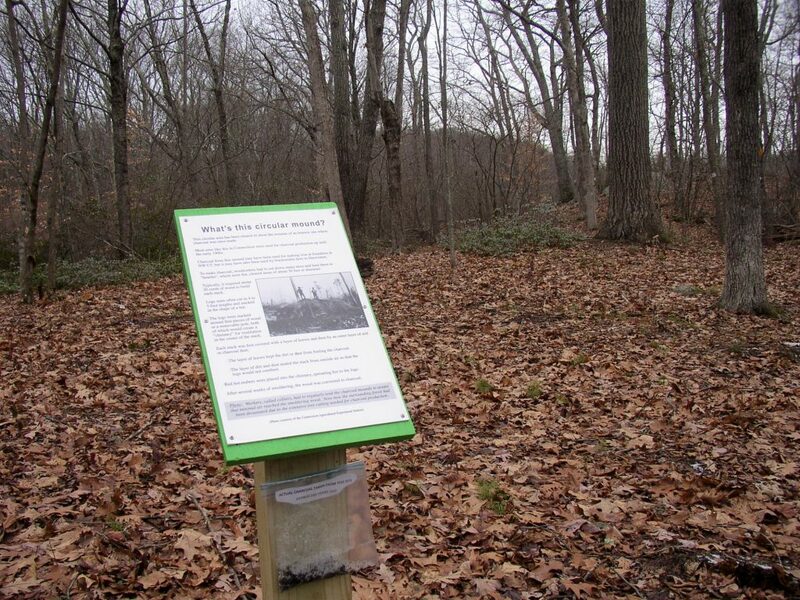 An informational sign describing charcoal mounds can be reviewed at the site. A sample of small chunks of charcoal uncovered from the mound can also be seen. The Harwinton Garden Club in 2014 for creating a flower garden by the Land Trust sign. The Town of Harwinton in 2015 and 2016 for providing gravel at the parking area. The Wilderness School in 2015 and 2016 for helping to improve trails, boardwalks, and the parking area. The NW CT Community Foundation in 2016 for funding the cost of lumber for boardwalks and in 2017 for funding the cost of plants for wildlife enhancement.